I have accomplished the first part of my goal, which is to display my open Bible on the otherwise empty kitchen counter. Yahoo! Okay, it's a smidge premature. I cannot show you the kitchen table. But this sight truly brings lightness to my heart. This project consumed my day yesterday, because it also involved putting away a few Christmas decorations. Not many so far, but more to come in the next couple hours. 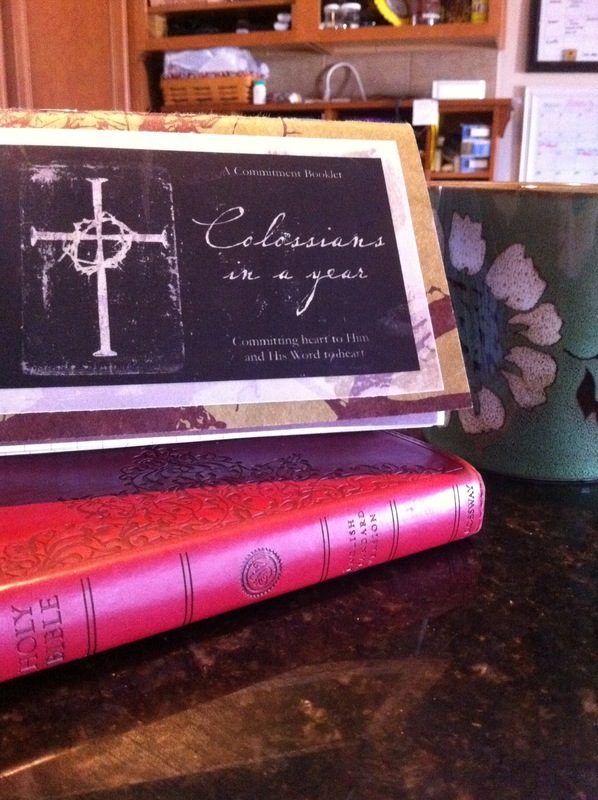 My day also involved creating a Bible memory booklet for Colossians. Since I know my goal for the year is to drink from the well, it's natural to see that memorizing Scripture fits with that goal as surely as my Kitchen Counter Bible reading plan. More about this memory plan next week, but if the idea of memorizing a book of Scripture in 2011 appeals to you, you are welcome to join the community on Facebook. Just two verses a week, it's not to late to join up! Read the genesis of the idea on Ann Voskamp's blog, A Holy Experience. I must return to the Christmas decorations and the kitchen table. To be honest (as I always am, right? ), the kids and the carpets need some attention as well. But I wanted to share these things with you. Have a lovely weekend. Great before and after picture between this post and your last one! Good for you! I'm visiting from incourage. I love the idea of your Bible open on the counter. Progress is beautiful when it has a noble purpose. I’m memorizing Philippians – so I’m with you kind of. I admire you in this initiative, Krista!